Friday February 1, 2019-Deputy President William Ruto has supported President Uhuru Kenyatta’s directive to the Cabinet Secretaries not to engage in the 2022 succession politics. Addressing the CSs yesterday at State House, the President warned them they risk being sacked if they don’t stop politicking. 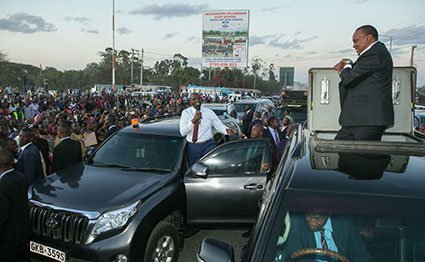 Speaking while accompanying Uhuru on his way to Tanzania, Ruto concurred with the President, stating that it was not yet time for politicking but for delivery. He urged the CSs some of whom are his greatest supporters to tone down on politics and concentrate on serving Kenyans for their own good and the good of the country. "We need to decide as Kenyans that we will live together peacefully and work together to develop our nation as well as the region. Politics alone cannot feed us, we will be fed by our hard work," Ruto stated.